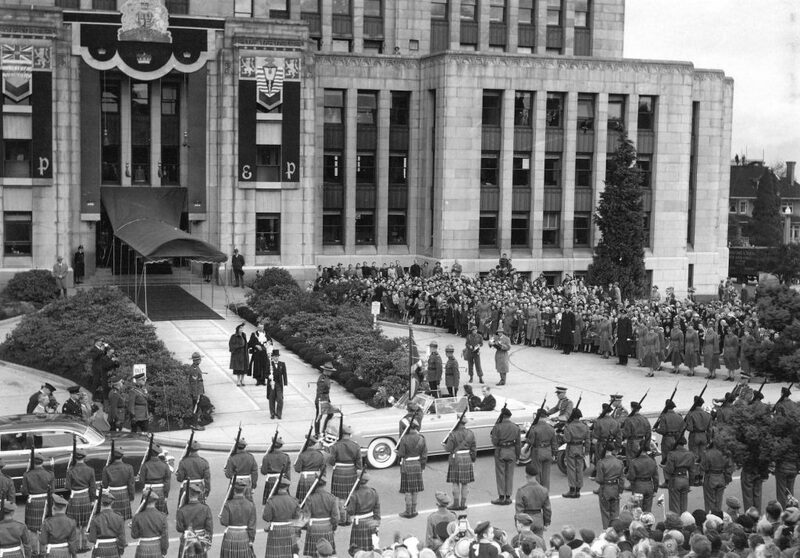 Canada was awash with hope following World War II, and in Vancouver the story was no different. The already growing city continued to expand as building regulations loosened, and today’s well-known skyline began to take shape. 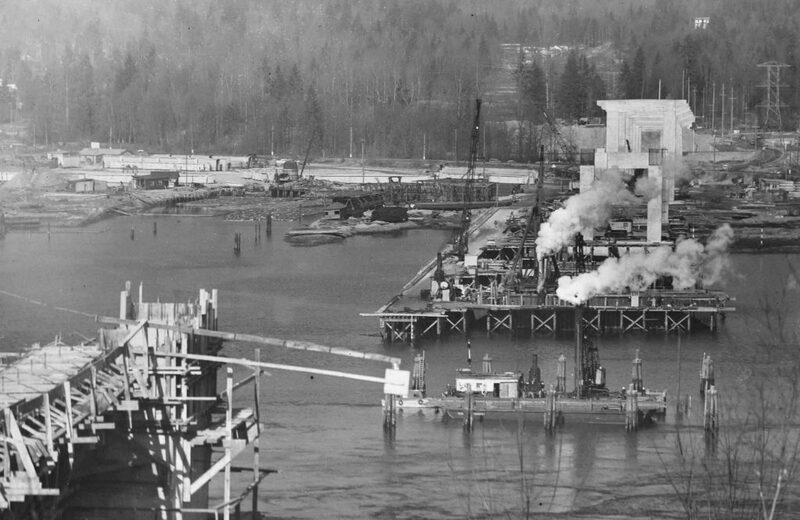 At the same time, new infrastructure allowed residents to better connect with each other, helping Vancouver become the hub it is today. 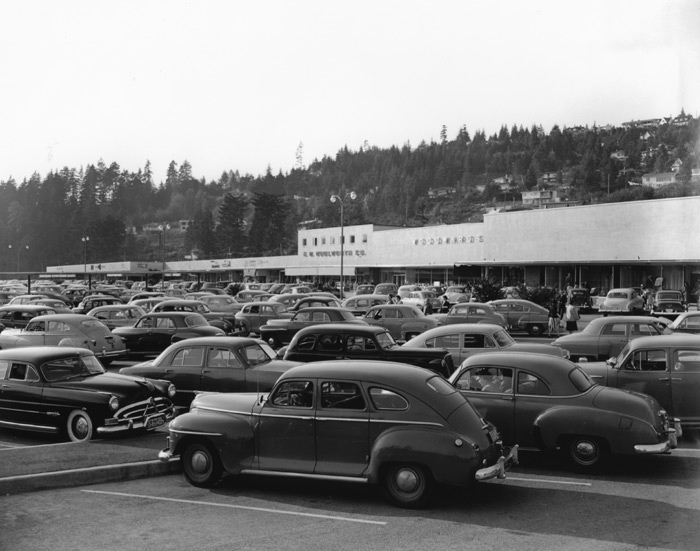 Scroll on to see some of the ways the city changed in the 1950s. The Duke and Duchess of Cambridge will soon be visiting Canada, and fans of the monarchy are getting excited — though probably not as excited as Canadians were for Princess Elizabeth and Prince Philip’s month-long cross-country trip in 1951. 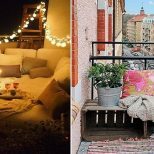 According to the CBC, “cities strove to be the most enthusiastic,” with Toronto vastly outdoing Quebec and Ottawa combined. The west coast leg of the couple’s tour included a stop in Victoria to watch First Nations dances, as well as an excursion to see a university football game in Vancouver. Prince Philip reportedly signed a football at the game, but not before security had deflated and reinflated it to check for threats. 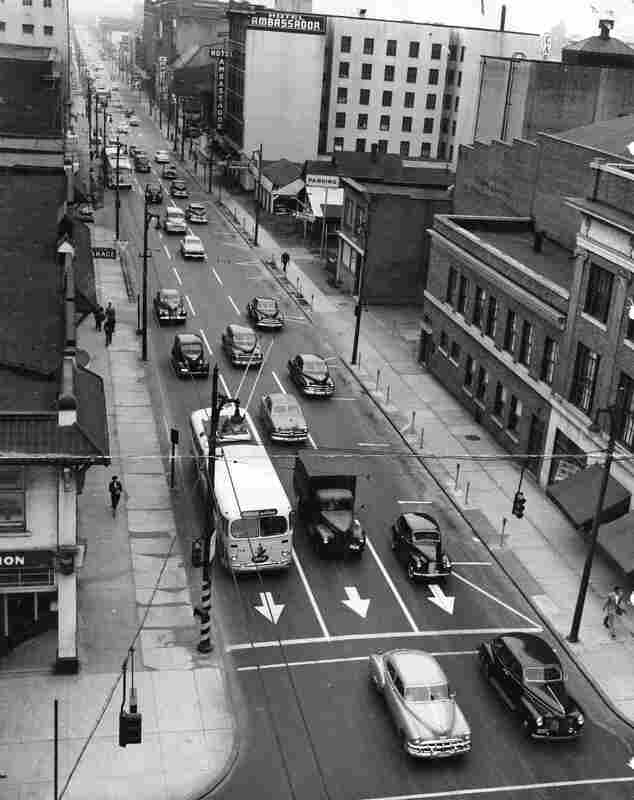 The intersection of Seymour Street and Georgia Street is right in Vancouver’s downtown core, and is much busier today than it is in this photo, taken in 1952. On the right are a parking garage and the Ambassador Hotel. Originally opened in 1913 as a set of furnished rooms, the hotel closed in the 1980s — it’s not to be confused with the current Hotel Ambassador, located elsewhere downtown. The Pacific National Exhibition, or PNE, has been a central part of summertime in Vancouver for a century, but its attractions have definitely changed over the years. While fried delicacies and agricultural exhibits are still mainstays, parades like the one shown in this 1953 photo are no longer part of the experience. Playland, now a popular amusement park adjacent to the PNE, was also not in the picture at the time — it didn’t open until 1958. Interestingly, the parade was held on Burrard Street near Pender Street, not particularly close to the PNE grounds at Hastings Park. The Hotel Vancouver, located in the heart of downtown and now branded as the Fairmont Hotel Vancouver, is the third hotel in the city to go by that name. Completed in 1939 at a final cost of $12 million, it took a lengthy 11 years to build as construction was halted during the Great Depression. 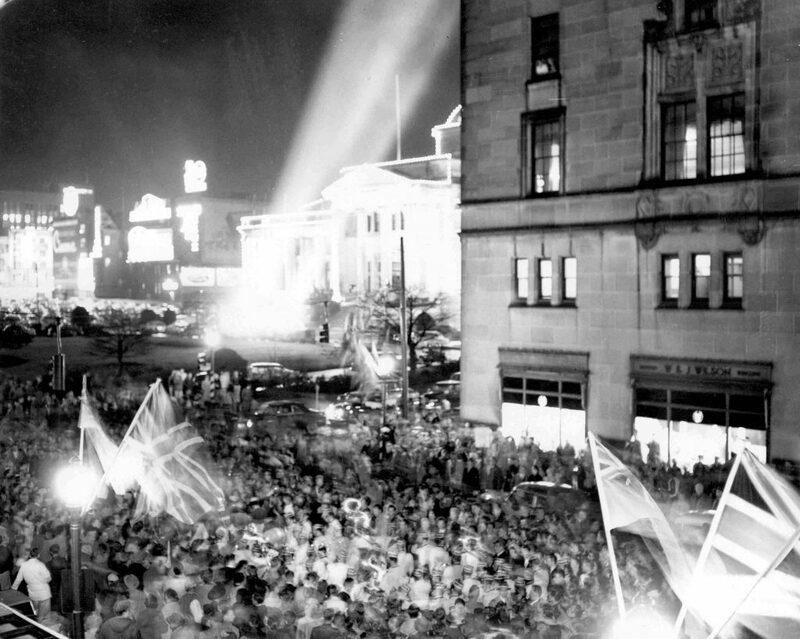 Above, a throng of people celebrate in the street after a Grey Cup game between the Edmonton Eskimos and the Montreal Alouettes. The cup had never been held in Vancouver, and had only been held outside Ontario once, so we think the excitement is understandable. Located at the intersection of Burrard Street and Nelson Street, St. Andrew’s Wesley United Church still exists today. Now a designated heritage building, it was designed by Twizel and Twizel and built between 1927 and 1933 using Nelson Island granite and Haddington Island stone. Interesting building features include a 14th-century-style Gothic tower, a high, vaulted nave and deep transepts. 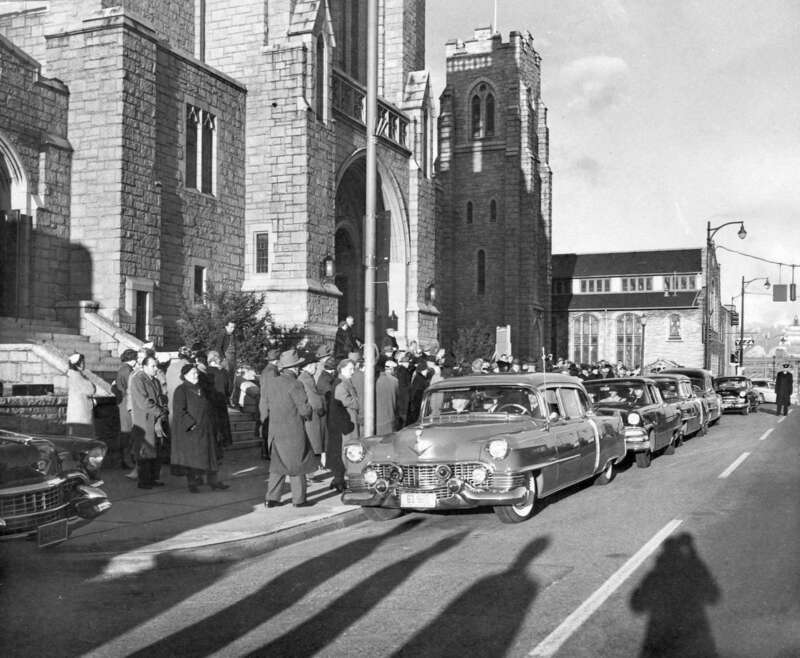 The funeral procession shown above was for Alderman Birt Showler. 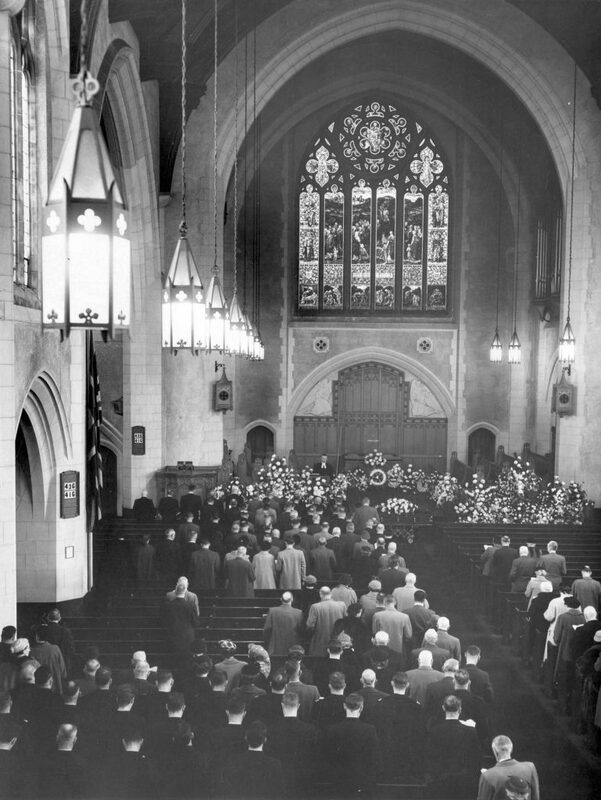 Shown above is an interior shot of St. Andrew’s Wesley United Church, also taken at Alderman Showler’s funeral. The church’s stained glass windows include both traditional leaded glass and more recent dalle de verre. If you want to see what they look like in colour, the church’s website offers a glimpse. 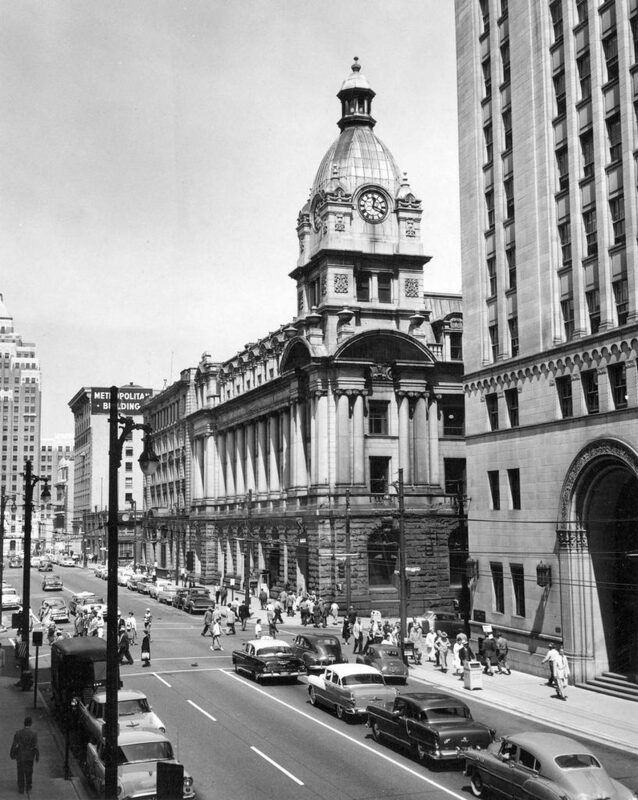 Vancouver’s main post office was held in the building shown above from 1910 until 1958, when it was relocated to a new building a few blocks away. It was built in the Edwardian Baroque style, which combines French and English influences, and underwent a restoration in the mid-1980s. Part of the work involved connecting the building with four other buildings via an atrium space — called Sinclair Centre, the complex is now an upscale shopping centre. 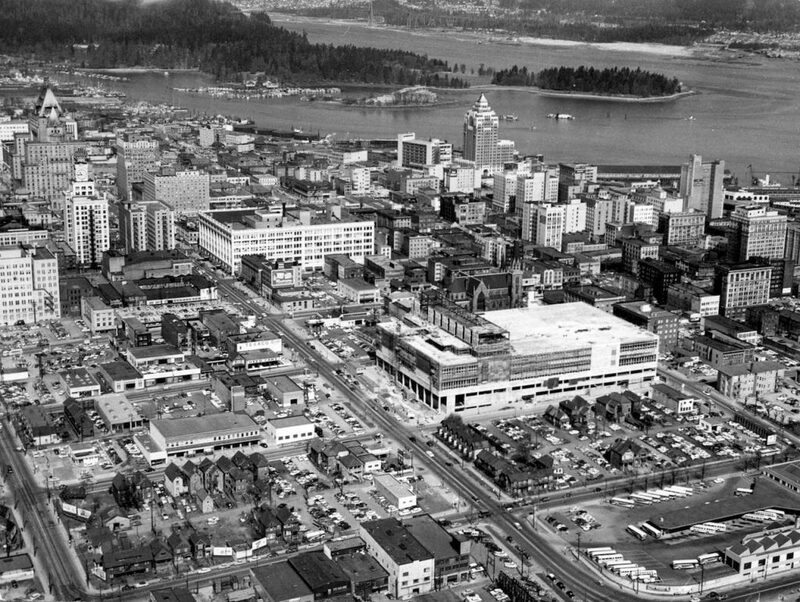 Some Vancouver landmarks are recognizable in this 1956 aerial view of downtown and Coal Harbour, but by and large the area is much less developed than it is today. 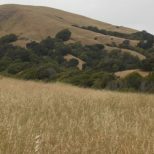 Photos of the region taken just a decade later look a little more familiar. Vancouver’s West End is also looking significantly less built up in this photo than it is today, but the calm wasn’t to last. 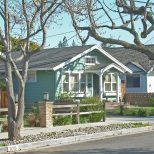 The 1950s saw major zoning changes and technological advances, and as a result cheaper and better multi-storey buildings began to be constructed. From 1962 to 1975 over 220 high-rises were built in the area. 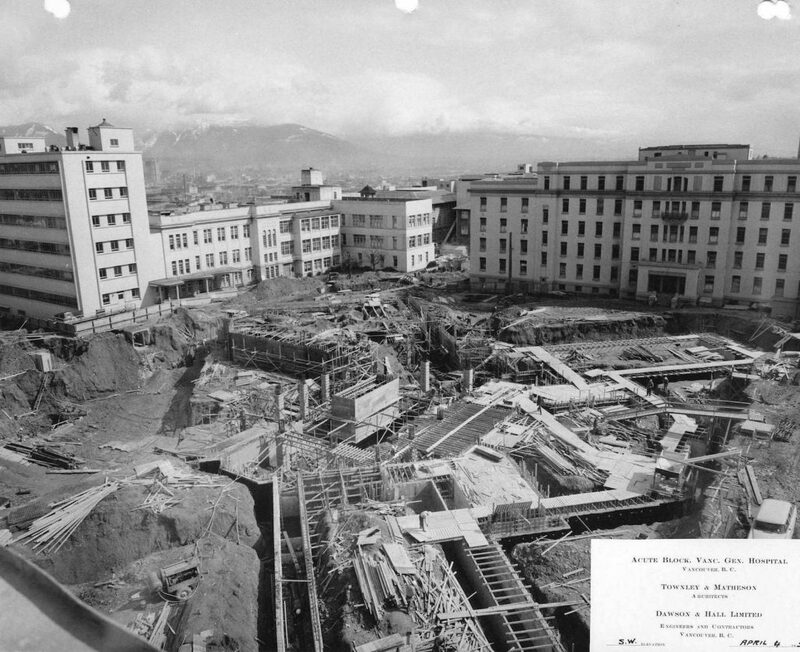 The Vancouver General Hospital has come a long way since its first iteration as a CPR tent hospital in 1886. 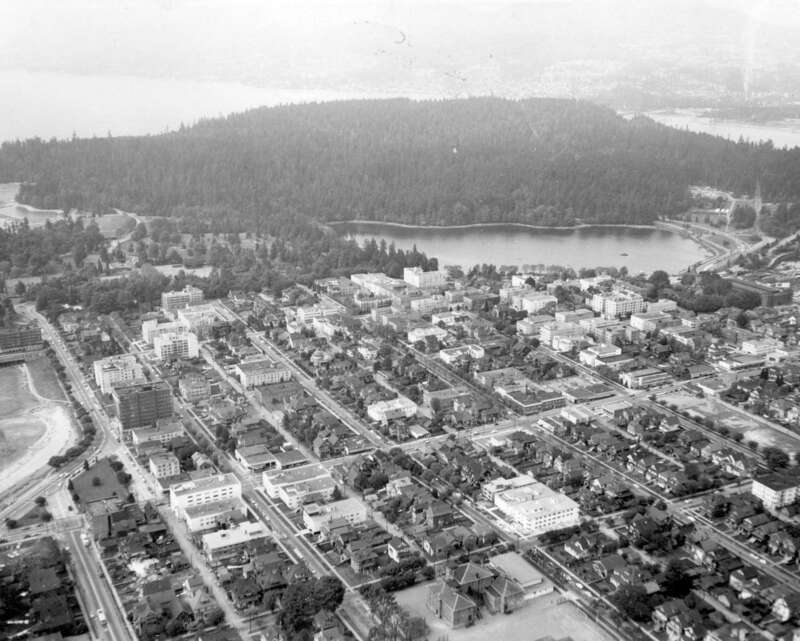 Not long after that it became a nine-bed wooden structure on Powell Street between Hawkes Avenue and Heatley Avenue, and by 1906 it had been moved to its current location on Broadway. 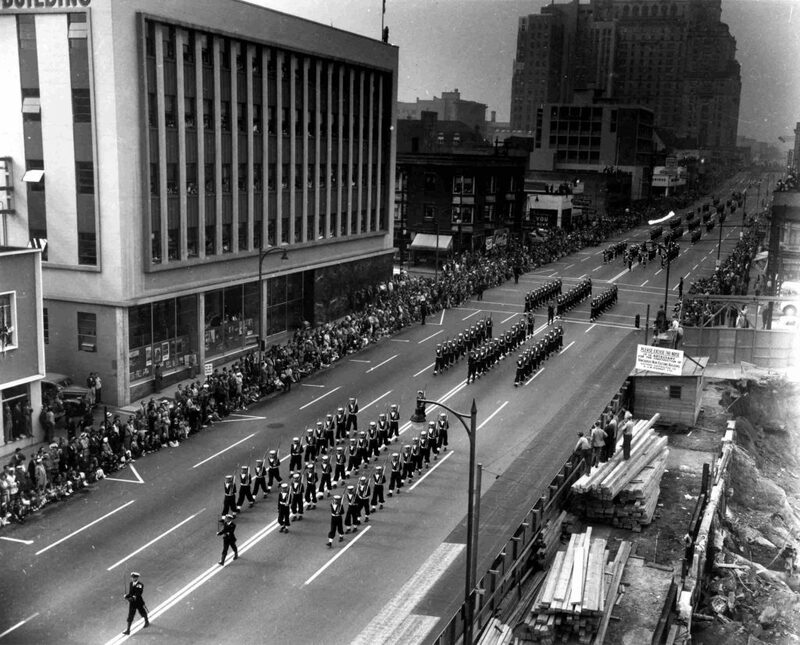 In 1959, the hospital’s new Centennial Pavilion was opened. Named to commemorate the centennial of the founding of BC as a British colony, the development was the largest part of the hospital at the time it was built. Shown under construction above is the pavilion’s acute block. Vancouver International Airport is currently Canada’s second-busiest airport, but this 1957 photo offers few hints of its exciting future — the runways are empty and the scene looks downright placid. 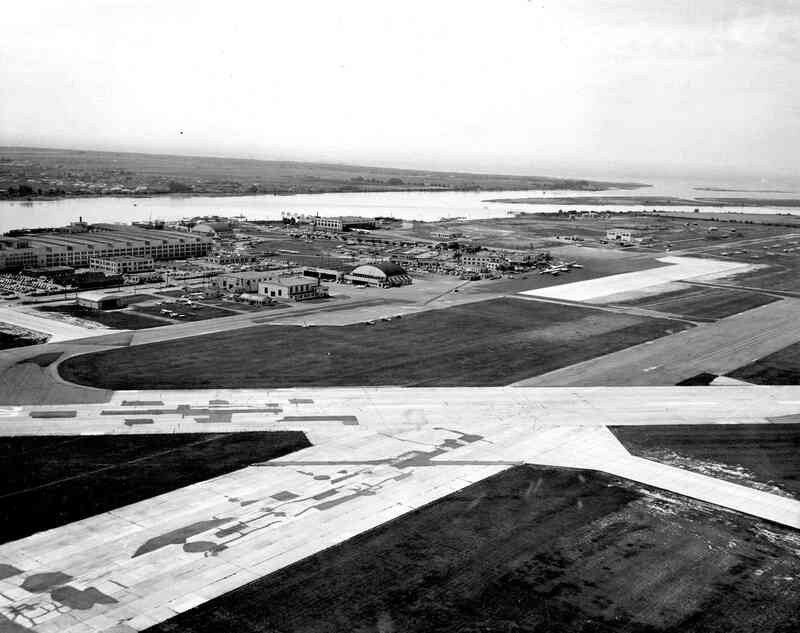 Even so, the airport was much bigger in the 50s than it was when it opened in 1931, with additions that decade including a new terminal and control tower.